HAVANA, Sep 15 (IPS) - If you enjoy a good daily shower and water comes out every time you turn on the taps in your home, you should feel privileged. There are places in the world where this vital resource for life is becoming scarcer by the day and the forecasts for the future are grim. A study by the National Aeronautics and Space Administration (NASA), which covers the period 2003-2013, shows that the world's largest underground aquifers are being depleted at an alarming rate as a result of more water being withdrawn than can be replenished. "The situation is quite critical," NASA scientist Jay Famiglietti has said, when discussing the subject in specialised publications in the U.S. In the opinion of this expert the problems with groundwater are aggravated by global warming due to the phenomenon of climate change. Far from diminishing, the impact of climate variations is also felt in greater changes in rainfall patterns, with serious consequences for Caribbean nations that are dependent on rainfall. In Cuba and other Caribbean island countries, in particular, periods of drought have become more intense. "There is a gradual decrease in water availability due to reduced rainfall, deteriorating water quality and greater evaporation due to rising temperatures," Antonio Rodríguez, vice-president of the National Institute of Hydraulic Resources (INRH), told IPS in an interview. Hurricane Irma, which in September 2017 tore almost through the entire Cuban archipelago, contributed to the relief of a drought that kept the country's people and fields thirsty for nearly four years. The current rainy season, which will last until November, began in May with Subtropical Storm Alberto with high levels of rainfall that will continue. "We have been able to show that climate change is real. We lived through 38 months of intense drought and then we had rains well above average," said Rodrìguez. The intense rains associated with Alberto, which hit Cuba in the last week of May, caused eight deaths due to drowning and serious economic damage in several provinces, but at the same time considerably increased the reserves in the 242 reservoirs controlled by the INRH, the government agency in charge of Cuba's water resources. Tarea Vida, the official plan to deal with climate change in force since last year, warns that the average sea level has risen 6.77 cm to date, and could rise 27 cm by 2050 and 85 by 2100, which would cause the gradual loss of land in low-lying coastal areas. In addition, there could be "a salinisation of underground aquifers opened up to the sea due to saline wedge intrusion." For now, "of the 101 aquifers controlled by the INRH, 100 are in a very favourable state," Rodríguez said. These sources also suffered the impact of the drought, but recovered with the rains after Hurricane Irma. In this context, the inefficient use of water, due to the technical condition and inadequate functioning of the water system, causes the annual loss of some 1.6 billion cubic metres of water in Cuba. In 2011, a strategic plan outlining priorities to address this situation began to be implemented in 12 cities from Havana to Santiago de Cuba in the east. When the programme began, losses amounted to 58 percent, both in the water grid and inside homes and other establishments. So far, the loss has only been reduced to 48 percent. Since 2013, however, work has been underway on a comprehensive supply and sanitation plan that covers more than a solution to losses in distribution. From 2015 to 2017, sewerage coverage has improved by 0.6 per cent and an additional 1.6 million people have benefited from the water supply. Currently, only 11 percent of the country's population of 11.2 million receive piped water at home 24 hours a day, and 39 percent at certain times of the day. In the remaining 50 percent of households, water is available only sporadically, and sometimes they go more than a week without water. 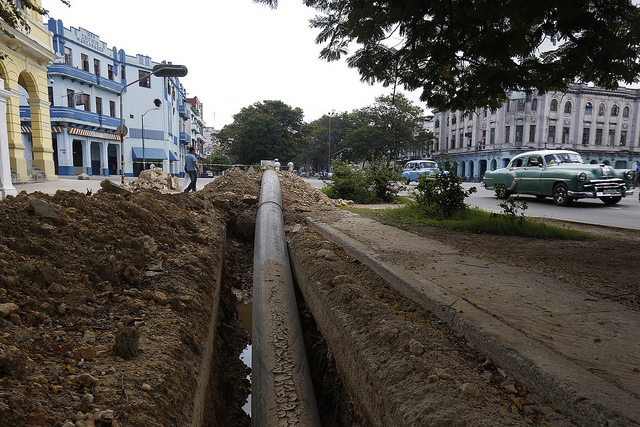 "I live in downtown Santiago de Cuba and we have two large elevated tanks and a cistern. We get piped water from the grid more or less every seven days and it is enough for us, even for our daily shower," a worker from the telephone company Etecsa told IPS from that city, asking to remain anonymous. Part of the historical water deficit in Santiago and other cities in the eastern-most part of the country has been alleviated through the transfer of water from regions with a greater supply. But during times of drought the supply cycles slow down. "That's why in my house we are careful with our water," she said. One study found that of the 58 percent of water lost, 20 percent is lost in homes. Another priority is to increase wastewater treatment. "Although in the country sewage coverage is more than 96 percent, only 36 percent of the population receives the service through networks, the rest is through septic tanks and other types of treatment," said INRH vice-president Rodrìguez. Among these challenges, he also mentioned poor hydrometric coverage. "We were able to get 100 percent of the public sector and all major consumers to be controlled by water metres, although in the residential sector this coverage reaches just over 23 percent of the population. From 2015 to 2017, more than 227,000 water meters have been installed, but the plan is to reach total coverage," Rodríguez said. "Without a doubt, water meters reduce consumption and allow us to measure the efficiency of our system," he added. Like other services, residential water supply is subsidised by the state and has a very low cost. "There are four of us and we pay 5.20 pesos a month (less than 0.25 cents of a dollar)," said María Curbelo, a resident of the Havana neighbourhood of Vedado. The national hydraulic programme extended until 2030 includes works for water supply, sanitation, storage, diversion and hydrometry, as well as the necessary equipment for investment and maintenance. "We are also working on the construction of seawater desalination plants," Rodriguez said. These plans include not only works to supply the population, but also everything necessary for agriculture, hotel infrastructure and the housing programme. Rodriguez explained that to carry out the programme there is both state and foreign funding, which has made possible a subsidised home supply. "We have benefited by foreign loans from Saudi Arabia, Kuwait, the Organisation of Petroleum Exporting Countries (OPEC), Spain's development aid agency and Chinese donations," among others, he said. These are soft loans with a five-year grace period, two or three percent interest and to be paid in 20 years, with the Cuban State as guarantor.